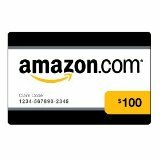 Who wants to win a $100 Amazon.com Gift Card? Amazon is one of my favorite places to shop! I can get great deals and shop from my comfortable recliner! It doesn't get much easier or affordable! I've have teamed up with Real Moms Real Deals and several other great sites to bring you this $100 Amazon gift card giveaway.